Point Bonita Light, at the North West entrance to the San Francisco Bay, was the second lighthouse at Point Bonita. The first light was atop the narrow headlands and shown forth at 306 feet above the roaring breakers of the Pacific. The only problem was that it was so high that most of the time it was obscured by fog. 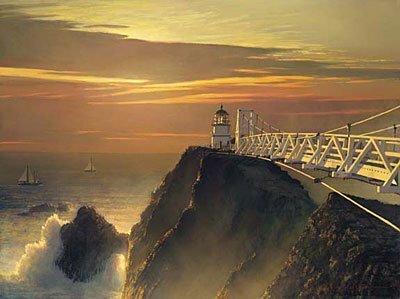 In 1877, the Point Bonita light was relocated, with great effort, to the thin strip of rock called Lands End where it stands today as a guardian at the Gate. A welcome sight to those entering the San Francisco Bay from around the globe.